Pope Francis on November 17, 2918, received in audience the members of the “Joseph Ratzinger – Benedict XVI Vatican Foundation” for the conferral of the Ratzinger Prize 2018, now in its eighth edition. The event took place in the Clementine Hall of the Vatican Apostolic Palace. After the greeting from Fr. 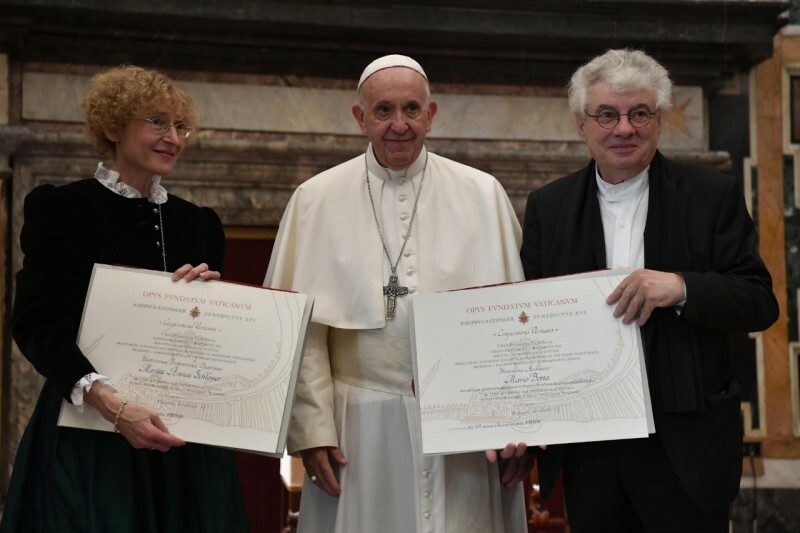 Federico Lombardi, S.J., president of the Foundation, his Eminence Cardinal Angelo Amato, S.D.B., prefect emeritus of the Congregation for the Causes of Saints and president of the Scientific Committee of the same Foundation, presented the profile of the two prize winners of this edition. Pope Francis then awarded the Prize. The winners this year are Marianne Schlosser, German Catholic theologian, a specialist in the Late Middle Ages and in Saint Bonaventure, professor of theology of spirituality in the Faculty of Catholic Theology of the University of Vienna since 2004; and Mario Botta, Swiss architect, who has built many religious buildings and several Churches. Today, however, I would like to express my particular appreciation for the two personalities awarded the Prize. I am very pleased that the award for research and teaching in theology is attributed to a woman, Professor Marianne Schlosser. It is not the first time — Prof. Anne-Marie Pelletier has already received it — but it is very important that the contribution of women to the scientific field of theological research and that of the teaching of theology — for so long considered almost exclusive territories of the clergy — be recognized more and more. It is necessary that this contribution be encouraged, and that it find a wider space, in keeping with the growing presence of women in the various fields of responsibility of the Church, in particular, though not only, in the cultural field. Since Paul VI proclaimed Teresa of Avila and Catherine of Siena Doctors of the Church, no doubt may be permitted regarding the fact that women can reach the highest peaks in the understanding of the faith. John Paul II and Benedict XVI also confirmed this by including the names of other women in the series of Doctors: St. Therese of Lisieux and St. Hildegard of Bingen. In addition to theology, the Ratzinger Prizes have since last year been appropriately conferred also in the field of Christian-inspired arts. I, therefore, congratulate the architect, Mario Botta. Throughout the history of the Church, sacred buildings have been a concrete call to God and to the dimensions of the spirit wherever the Christian proclamation has spread throughout the world. They expressed the faith of the believing community, they welcomed that community, helping to give form and inspiration to the prayer of that community. The commitment of the architect, creator of sacred space in the city of men, is therefore of highest value and must be recognized and encouraged by the Church, especially when we risk the oblivion of the spiritual dimension and the dehumanization of urban spaces. 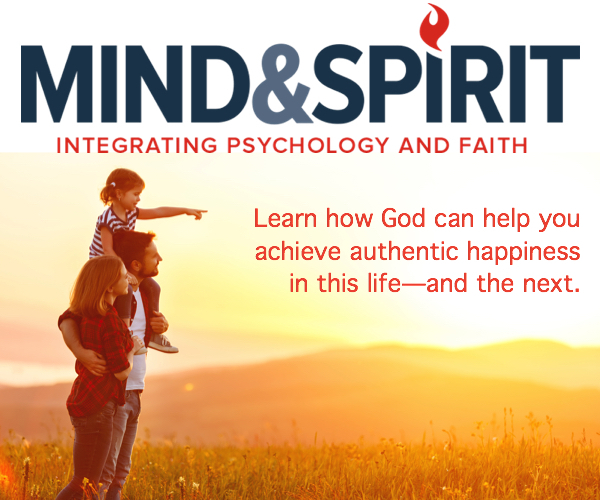 Against the backdrop and in the context of the great problems of our time, theology and art must, therefore, continue to be animated and elevated by the power of the Spirit, which is the source of strength, joy, and hope. So, allow me to conclude by recalling the words with which our Pope-emeritus invited us to hope, by evoking the spiritual elevation of a great theologian and saint particularly dear to him, and well known by our Prize-winner, Professor Schlosser. On the occasion of his visit to Bagnoregio, home of St. Bonaventure, Benedict XVI expressed himself thus: «We find a beautiful image of hope in one of his sermons for Advent, in which he compares the movement of hope with the flight of a bird that spreads its wings to their maximum capacity and draws on all its strength to flap them. In a certain sense, it makes its whole self-movement, to soar upwards and fly. Hoping is flying, St Bonaventure says. But hope requires that all our limbs become a movement, projected to the true height of our being, towards the promises of God. Whoever hopes, he affirms, “must lift his head, turning his thoughts aloft, to the heights of our existence, namely to God.” (Sermo XVI, Dominica I Adv., Opera Omnia, IX, 40a)» (Address in Bagnoregio, 6 September 2009).